Taken in England, May 2009. This entry was posted in Blogging, Life, Photography and tagged postaday, postaday2012, weekly photo challenge by flamidwyfe. Bookmark the permalink. Children were my first thought when I saw the prompt free spirit. Great shot! 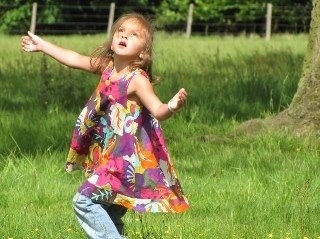 Thank you 🙂 It was a wonderful day in Stokes Poge and my little free spirit enjoyed doing twirly all over that meadow! That was a fun day. Many beautiful pics were taken. Thank Alicia. Loved Stoke Poges. Beautiful Parish and gardens. It was my very favorite day of the whole trip! Awesome shot!! Like the gravatar I use, happy kid!! Very happy kid… yes! I love your gravatar! Definitely a free spirit! Great shot, Sandi.